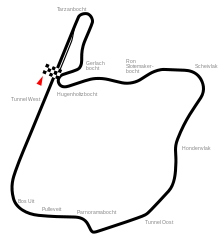 The 1976 Dutch Grand Prix was a Formula One motor race held at Circuit Zandvoort on 29 August 1976. It was won by British driver James Hunt driving a McLaren M23 on his 29th birthday. The weekend was marred by the death of track marshal Ron Lenderink during a touring car support race. He was 29. Wikimedia Commons has media related to 1976 Dutch Grand Prix. ^ Lang, Mike (1983). Grand Prix! Vol 3. Haynes Publishing Group. p. 142. ISBN 0-85429-380-9. ^ Lang, Mike (1983). Grand Prix! Vol 3. Haynes Publishing Group. p. 144. ISBN 0-85429-380-9. ^ "Motorsport Memorial -". motorsportmemorial.org. ^ "1976 Dutch Grand Prix". formula1.com. Archived from the original on 10 December 2014. Retrieved 23 December 2015. ^ a b "Netherlands 1976 - Championship • STATS F1". www.statsf1.com. Retrieved 15 March 2019.